The 1948 Cadillac Series 61 and Series 62 were the first new designs from the company following World War II. The wheelbase was shorter than the 1947 models, which were basically warmed-over 1942s. But the big news was the appearance of the Cadillac fin, which housed the rear taillight and made the car look lower. Fins would characterize Cadillacs for the next 30 years, and would be adopted as a styling cue across manufacturers through the end of the 1950s and beyond. The 1948 model year was abbreviated to about eight months and production was modest. The lower line Series 61 only sold 8,600 units, in four-door sedan and two-door fastback sedanette body styles. The big seller in the Series 62 line was the four-door sedan, which accounted for 24,000 of the model’s $34,000 sales. In the Series 62, a club coupe cost $2,900 and a convertible ran $3,400. 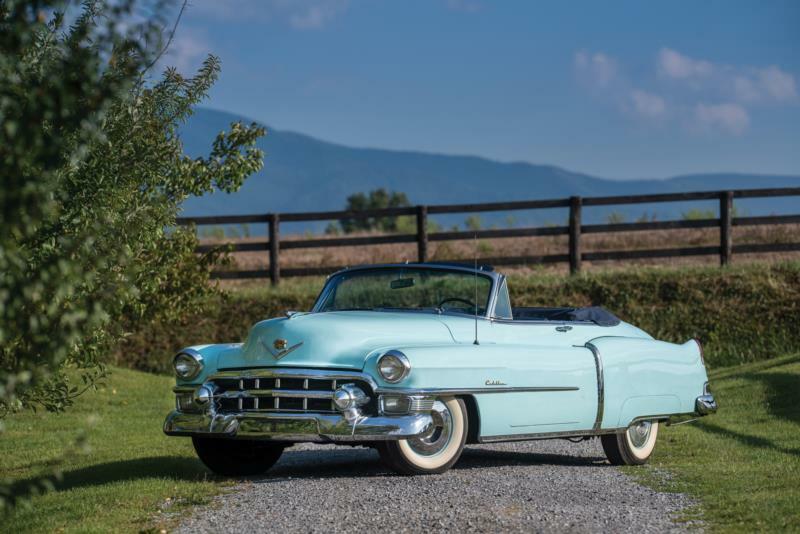 The other shoe dropped in 1949 when Cadillac introduced the new 160-hp OHV, 331-cid V-8 as a replacement to the ponderous 346-cid side-valve unit. Series 61 sales increased to 22,000 while Series 62 shot up to 55,000, of which 2,150 were the brand-new pillarless Coupe DeVille two-door hardtop. For 1950, the Series 61 and 62 were extensively redesigned, with lines that would continue for the next few years. The cars were longer, lower, and looked more solid. The side of the car flowed into the rear fender, where the leading edge was interrupted with an imitation air intake. One-piece curved windshields were introduced, the grille became more massive, and the hood protruded further in the center. Hydra-matic transmission was now standard on the Series 62 and optional on the Series 61. Changes for 1951 mainly amounted to more chrome for the Series 62 and Hydra-matic becoming standard on the Series 61, before that line was discontinued mid-year due to slow sales. The 1952 model year was an anniversary year for Cadillac, mostly reflected in more trim, fancier gold colored badges, scripts and V emblems. The exhaust now exited through the rear bumpers and four-barrel carburetors were standard. Power rose to 190 hp. Cadillac’s 1953 model year is mostly remembered for the launch of the Eldorado convertible, with its wrap-around windshield and wire wheels. The Series 62 underwent a number of detail changes, but they mostly involved moving chrome trim around. Power, however, was now up to 210 hp, and a total of 85,000 Series 62s were sold, making it the most abundant year of this generation. Early 1950s Cadillacs survive in good numbers today. They are fast for their size (0-60 in under 12 seconds), and can be coaxed to return 20 mpg highway. Given these car’s original demographic, survival rate is excellent and these cars have usually been garaged for much of their life. Construction quality and materials were good and parts are reasonably available, all of which amounts to a great ownership experience.